Take around seventy students from France, Germany, Spain and Turkey, put them in a room and tell them to speak English, think English, read English and write English about Peace and Tolerance. What happens? 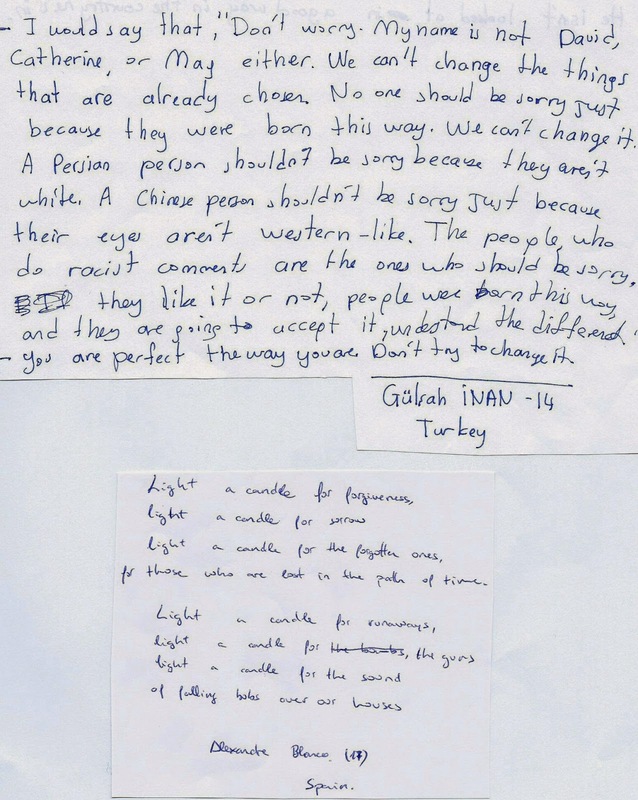 "Everyone wrote, said and did something about peace, they were creative, honest and nice." Gulsah, 14 years,Turkey. "I learn sisterhood." Fatma, 16 yrs, Turkey. In October, 2014, I was invited for a second time to the Lycee Maurice Genevoix in Paris to lead workshops on Peace and Tolerance. The school is part of an EU project and this time the partner schools from Germany, Turkey and Spain were joining us. All the students were divided into two groups and each group would have a two hour workshop with me. How could I make sure that this mix of students with such varied abilities in English, whom I had never met before, had a positive and meaningful experience and gained some insight into working for peace and tolerance? I need not have worried. The students came prepared to struggle with their English, listen, debate, question, laugh, say things out loud which are really quite difficult to admit to ...."I do not feel I can say that I am proud to be Jewish in France today".... and meet the Other from another country with an open heart and an open mind. It was a privilege to work with them. 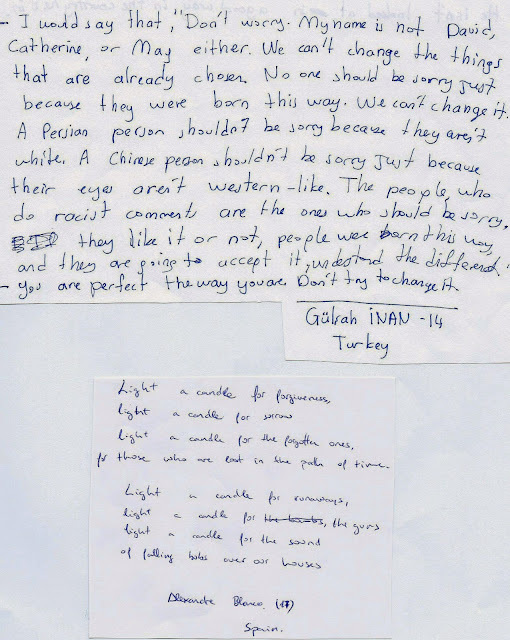 I started with a poem by a boy who was an asylum seeker from Bosnia. Unfortunately his name is not known. This the opening of the poem and we had it translated into French, German, Spanish and Turkish. Then students came forward to read the entire poem in all five languages. It was a very moving experience. Even unhappy stories have to be listened, so raise your voice, tell it to everyone. The only ones to blame are those who refuse to pay attention. Alex, 17, Spain. I met Sami Hazbon for the first time earlier this year on my first visit to the Lycee. He had only recently arrived with his sister, escaping the war in Homs, Syria. Sami speaks excellent English. It was lovely to see the progress he is making and how well he is settling into his new life, even though it has been very hard for him. Sami has read my novel HIDDEN and commented on how he related to this story of asylum seekers. The students then talked in groups before writing their own poems. Light a candle for freedom/ for a free men, for prosperity/ light a candle for humanity/ light a candle for no war in the world/ light a candle to light way of peace. Mustapha, France. Yes, light a candle/ because bad things only happen in darkness. Pablo, 17. Spain. Light a candle and you have a way/ light a candle to help. Felix and Paula, Germany. Light a candle for respect/... light a candle for the animals. Rima, 15, France. Peace is a necessary and we light a candle for peace. Thank you Miriam. It is good. Fatma, 16, Turkey. Light a candle for all the people who come from Adam and Eve, to understand that we are all brothers and sisters/ Why not light a candle for brotherhood and the peace of humanity? Ahmet Murat, Teacher, Turkish Team. On the feedback form at the end of the session, the students give us a sense of what they feel they gained from working together and writing together. It is great to talk with people who lives away of France and to listen to what they thought. Deradji, 17, France. I like when we must speak with our team and the not easy questions. 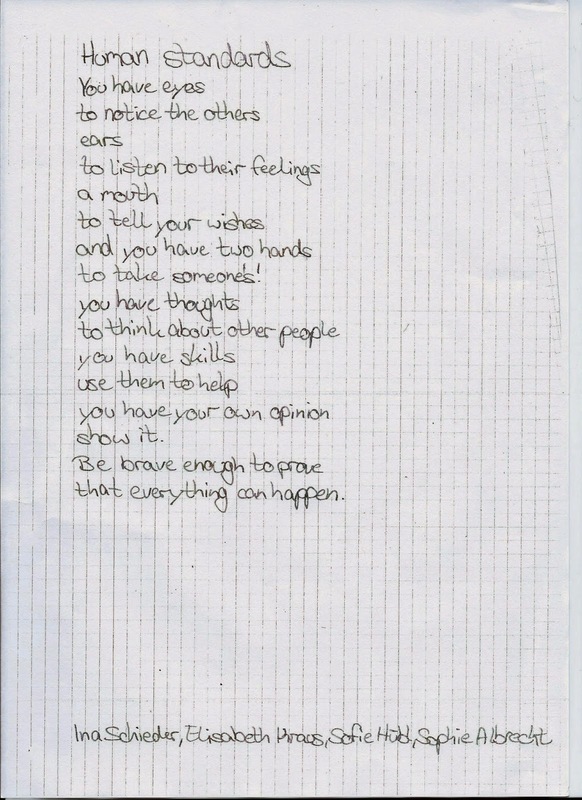 Hannah, 15, Germany. Be who you are, you are never alone! Sofie, 15, Germany. The conference help us to think about people who haven't our opportunities. Pablo, 17, Spain. Great to have different points of view from different countries about peace. I really enjoyed it. Pablo Costas, 17, Spain. The pleasure was all mine. I could write much more about the sessions but I feel that the students words are more valuable. I also had the chance to meet up with a group of older students I had first worked with on my previous visit. They particularly liked a poem of mine called, Corner Shop. The poem is set in my local shop just as the first Gulf War broke out. Standing in the queue were orthodox Jews, young children, Hindu aunties and the Japanese hairdresser from opposite. Someone said something about the war and there was a silence. Then the Muslim shopkeeper said,"We won't let that come between us." "No! Quite right!" everyone agreed. pressed like coriander in a wrinkled palm. the handshake, brown on white on olive. prisoner released, girl unharmed, bomber stilled. Two of the girls translated this stanza into French and Arabic. We were filmed as we read out the stanza in all three languages. You are the peace process! Hania, 16, France. Continue to do this workshop for peace. Lucas, 17, France. The debate on HIDDEN was interesting. It make us think more deeply concerning world peace. Like it! Dora, 16, France. The debate about Muslim and Jewish people was interesting. Thank you to Miriam for coming, she is an interesting woman. Dea, 17, France. I learnt about the organisation English PEN and to be more open-minded. Keep doing that, it's awesome for you and the pupils. Chloe, 17, France. I learnt about the very interesting motto of English PEN and Miriam's actions for peace and her meaning of peace. We are citizens of a peaceful world. An inspiring and moving post Miriam, thank you. Inspiring. One to come back to - thanks, Miriam. A very inspiring post, and what amazing kids! Thanks, Miriam. Wonderful, hopeful, inspiring words. There's hope for the world yet, people. Thanks for sharing your values and talents with others, Miriam, and for sharing your experiences with us. Many thanks for all the comments folks. it certainly was an inspiring experience. Thank you Sami and the sense of inspiration was the same for me. All the best with everything. How heart warming that these pupils from disparate backgrounds and cultures could come together and discuss the importance of peace. Some very nice compliments to Miriam, who I hope feels the sense of achievement that she deserves. These people are young and very inspirational. Let's hope they will remain committed to peace and understanding when they reach adulthood and can continue to inspire others in this way of thinking. Thank you for the amazing workshop! It was a very beautiful picture : You in the middle of these young people speaking about peace! The students have grasped why you love working with young people like themselves. Many of them said ' ' Miriam knows that we are the future generation, so we can change things. ' ' I Thank you ! That's lovely Sarah and very encouraging. The young people I meet in Paris are consistently wonderful and committed. I always come home feeling inspired and encouraged by their determination to work for peace.